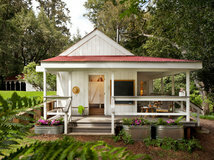 Garages and sheds on Houzz came with plenty of surprises this year. 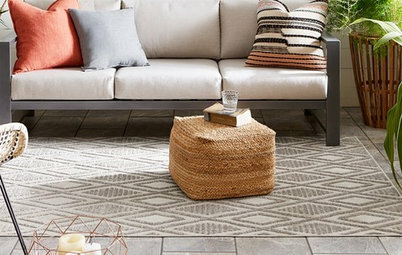 While Houzz users added plenty of photos showcasing organizational concepts to their ideabooks, they also loved seeing creative transformations of this often-underused space. A backyard office, a unique play pavilion and an amazing man cave are just a few of the spaces that topped the popularity list for the past year. Which one is your favorite? 1. Ultimate organization in Brooklyn. 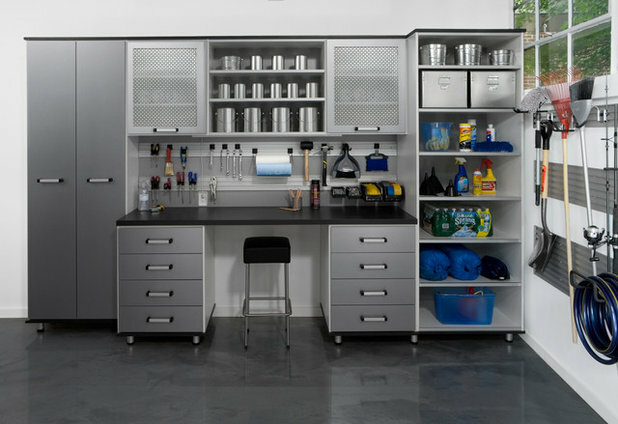 This small New York garage has a place for everything. 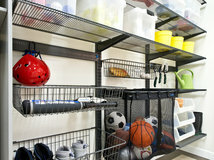 The compact solutions — hooks on the wall, file cabinets, open shelving — could prove useful in any storage space. 2. A 92-square-foot refuge in Austin. 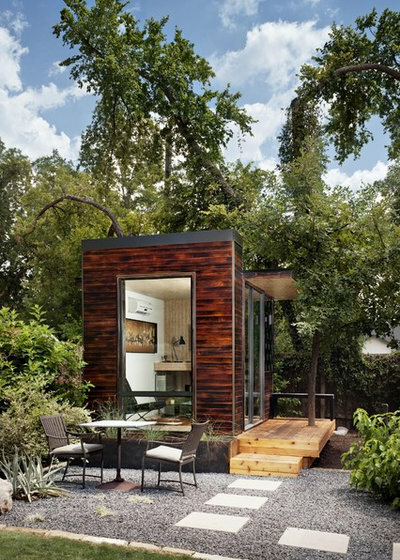 A wonderfully modern surprise in a Texas backyard, this prefab shed serves as a backyard office and part of an outdoor haven. 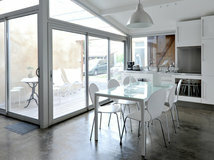 Many Houzzers thought something this small would be the perfect way to experiment with prefab design. 3. San Francisco backyard cottage. 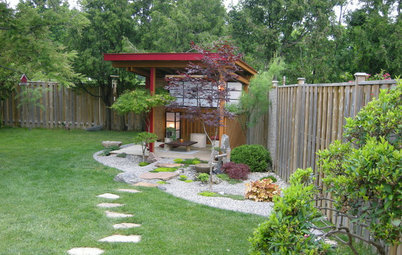 Even homes with a yard smaller than this one often have room for special touches. 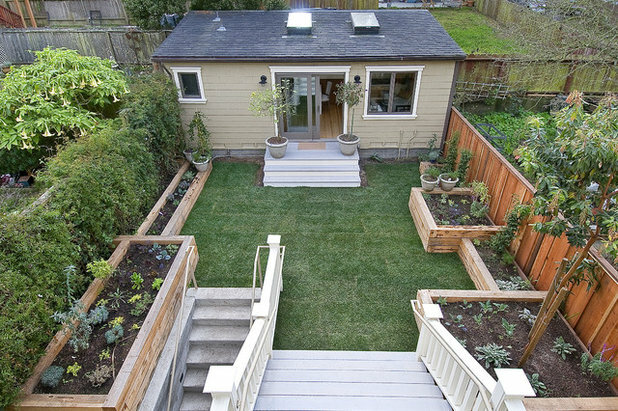 This yard has many inspiring small-space ideas — readers particularly liked the raised garden beds. 4. Seattle garage-turned-playspace. These homeowners turned their garage into the ultimate play pavilion for their children. While the first floor still stores the family car, the second floor now serves as a multipurpose space that focuses on activity instead of TV. 5. Cabin-style Minnesota carriage house. 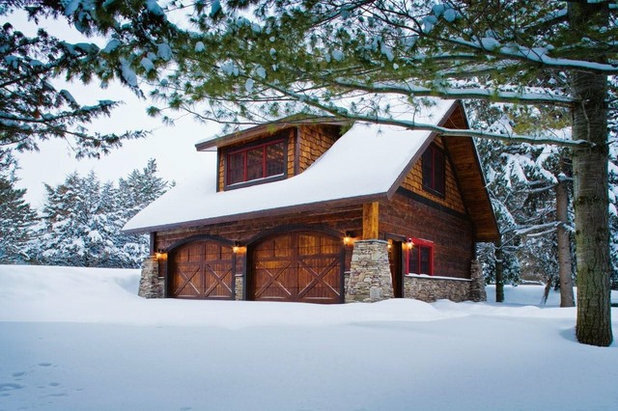 This heavenly winter home is actually a spacious carriage house, constructed in a rustic log-cabin style. 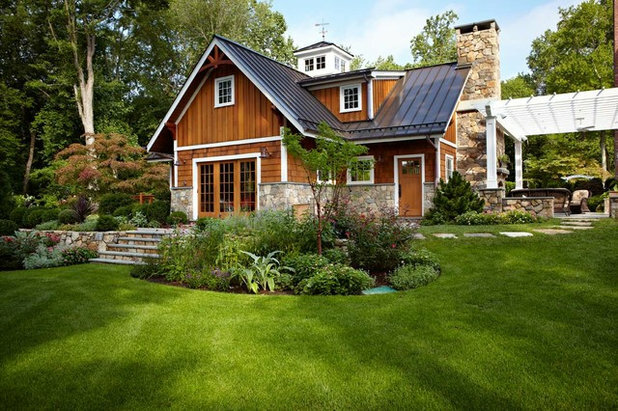 Houzzers loved every little detail of this space — including the red trim, exposed stone and shingled dormer. 6. 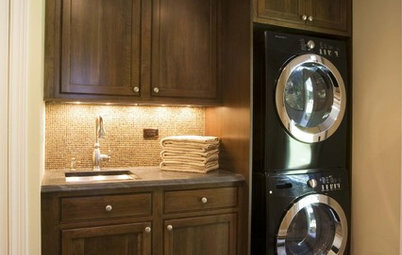 Customized storage for a Massachusetts family. A big and busy family can always use a little help with organization. 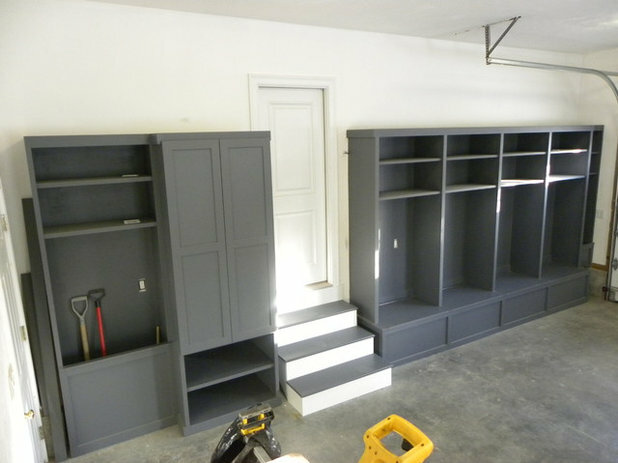 These custom-built storage units in a glossy gray each have a small bench where family members can take off shoes, and a lid that lifts up for extra storage. 7. Traditional stonework in Marblehead. Nestled next to a romantic home in Massachusetts, this garage has the same storybook feel as the main house. 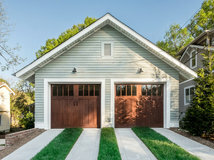 Most Houzzers saved this photo for its beautiful custom garage doors made of dark wood. 8. On-the-wall family storage. 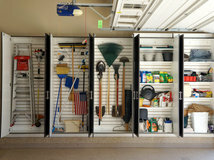 The best thing you can do to keep your garage organized is to get things off the floor. This garage makes use of a handy system that keeps everything from scooters to surfboards out of the way. 9. 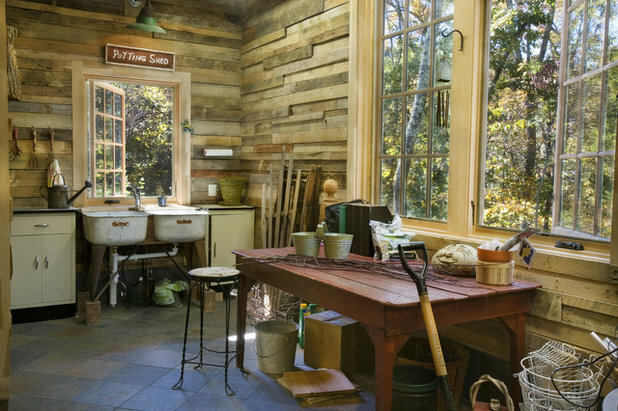 Rustic Tennessee potting shed. 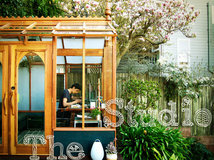 Houzzers loved the dreamy, rustic feel of this potting shed. 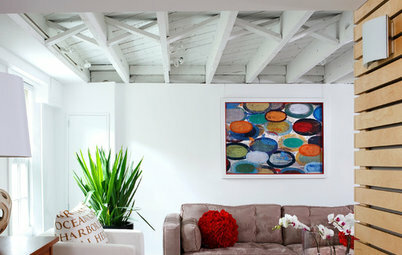 It's set amid rural woods, and recycled wood pallet walls give the space the worn-in look and feel of a barn. 10. Car lover's man cave in Connecticut. 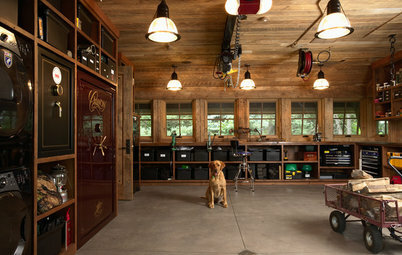 Designed to be the ultimate man cave, this space stores much more than a few great cars. 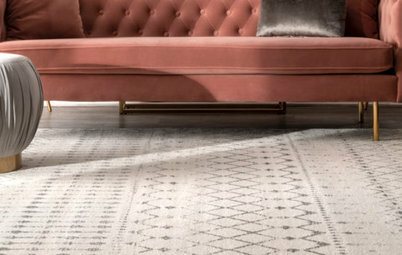 A wine cellar, subterranean parking, a car elevator and a vanishing TV in the bathroom mirror are only a few of its amazing features. Where are the tool boxes, chop and table saws, router tables, hardware cabinets, nail guns, air compressor welders, vises and work benches that make all these home projects possible located? Can you do a feature on actual home work area design ideas?